The Philly weather said 5 inches of snow. No biggie right? Sure. I’ve seen that before..once. Growing up near the beach, snowfall was a rarity and still continues to be. 5 inches would have been big news. Schools closed. Snowball fights ensued, and the snowman population increased 3%. 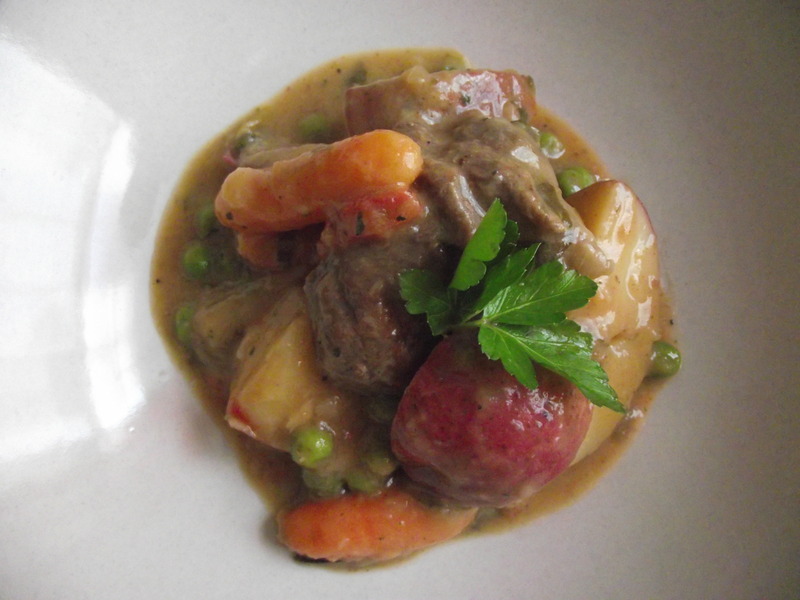 After we’d come home soggy and blue with frostbite from playing outside all day, my sister and I always looked forward to the hearty stews simmering on the stove. Oh how it melted you to the core. 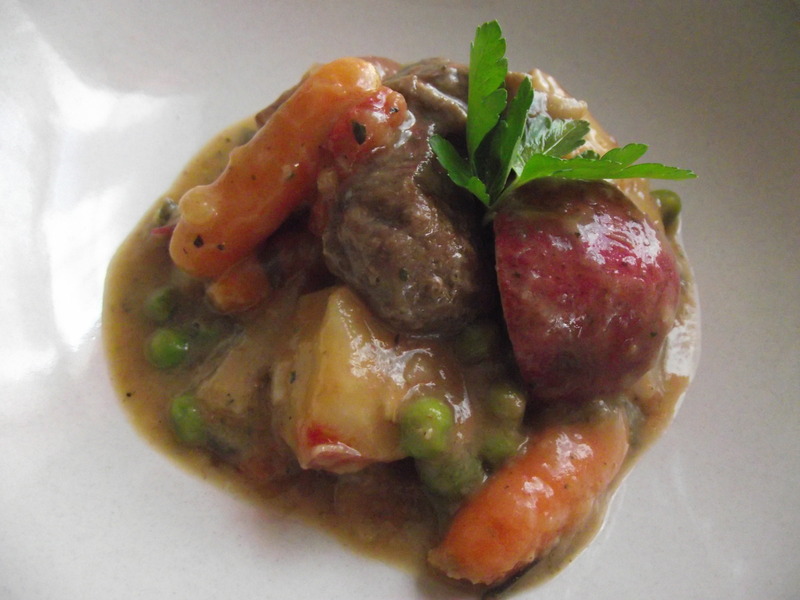 Beef stew. Classic. Comfort. Food. I followed a recipe on foodnetwork.com but I made a few adjustments here and there to make it my own. As you’ll see, it’s quite versatile and the only downside is the cook time. I suggest starting this in the a.m. so you’ll have it ready by dinner. Cook time: forever. Serves 3. 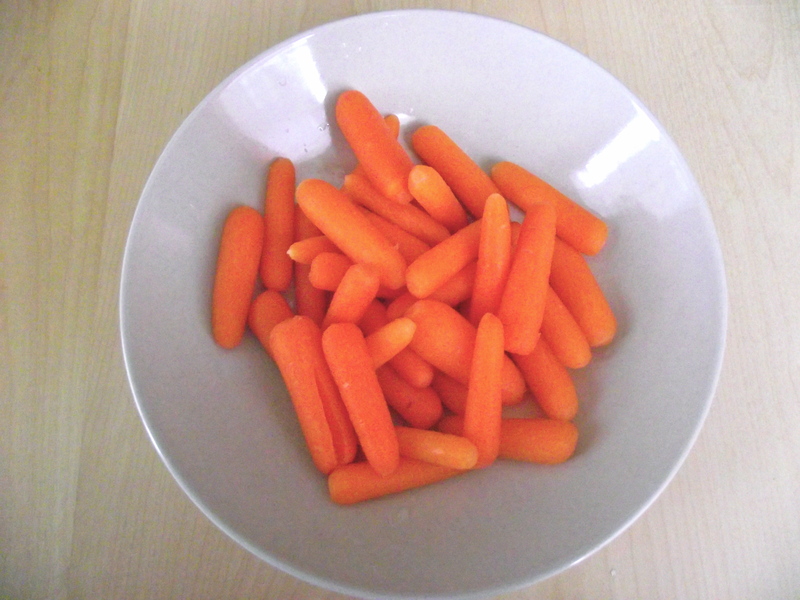 I used baby carrots but you’re more than welcome to use grown up carrots too. Short cuts are ok every now and then. I have no idea why these look radioactive orange here. 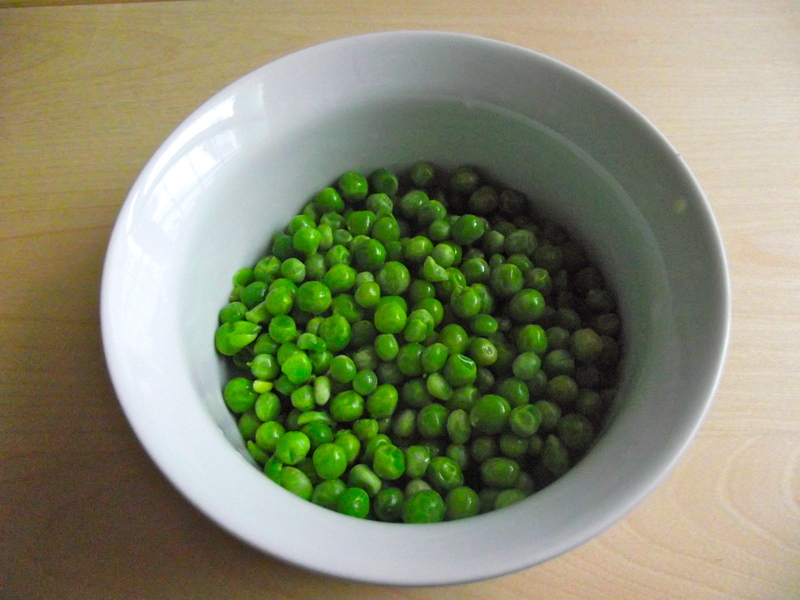 Typically, beef stew calls for celery but I’m not a big fan of those, so I substituted them with peas. I don’t know what it is about celery but even slathering them in peanut butter can’t make a believer outta me. However, if you love celery in your stews, knock yourself out! Step 2: Chop the aromatics and herbs. 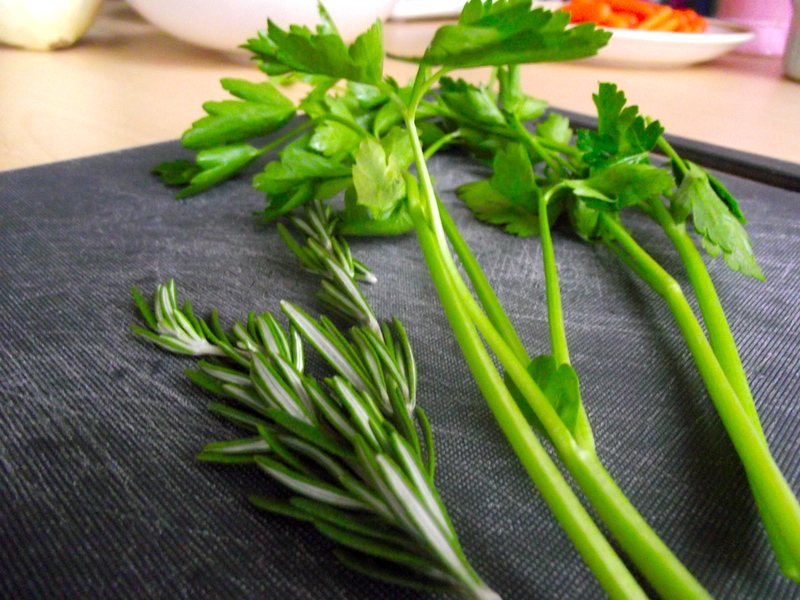 Snip off parsley leaves, give them a rough chop then set aside. Leave the rosemary as is. I used 2 sprigs but next time I’ll use just one. Using 2 was a bit too ‘herb-y’ for me. 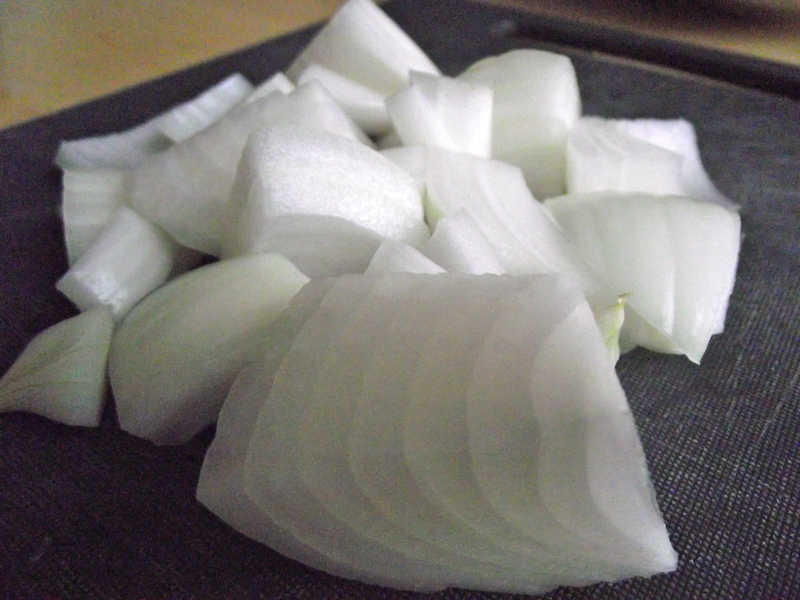 Slice the onion into big chunks. Then cry a little because the fumes drive you to tears. 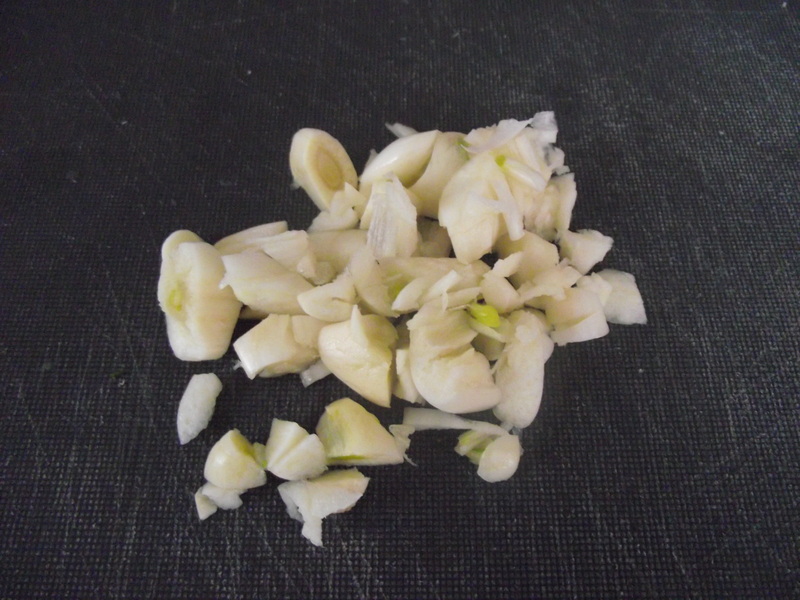 Crush the garlic cloves and give em a rough chop. Which reminds me, I need to get a new chopping board. This one’s lookin’ kinda rough. It’s well loved. 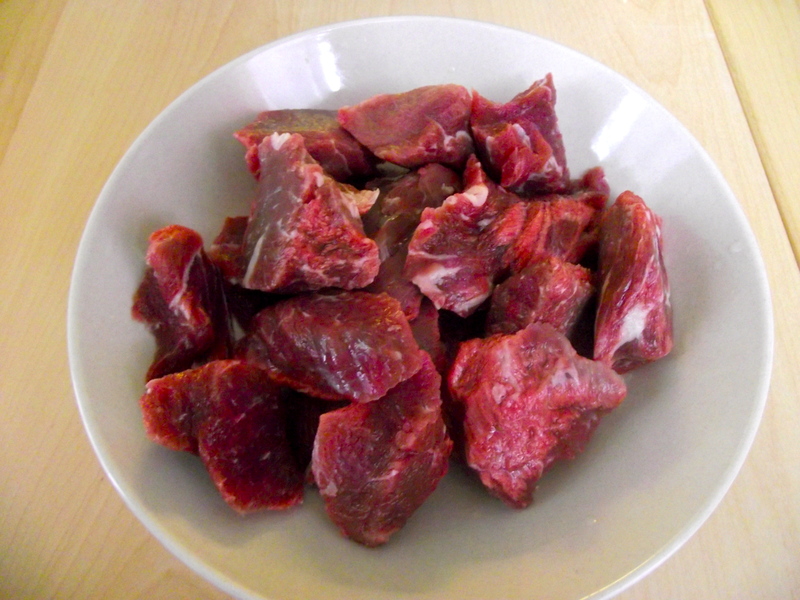 Step 3: Take the meat out, wash and slice into cubes. Or, you can do like me and let the cute butcher at Whole Foods cube them up for you. Why not? He offered when I said I was making a stew. He was nice like that. Step 4: Take out a frying pan, drizzle a little bit of oil and heat on medium-high. Season the beef with salt and pepper while you wait. When the oil is heated, add the meat cubes. Then Don’t. touch. them. Let them sizzle, let them sit and get seared into that golden brown crazy goodness. This should be about 3-4 minutes. With a pair of tongs, flip the cubes on to the other side and repeat. 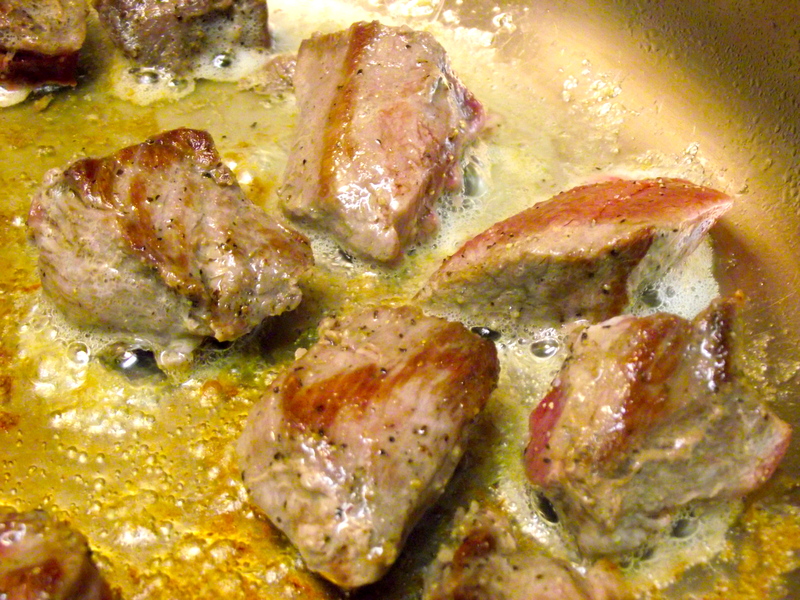 When all sides are browned, remove the meat from the pan and set them on a plate. Turn the heat down to medium. 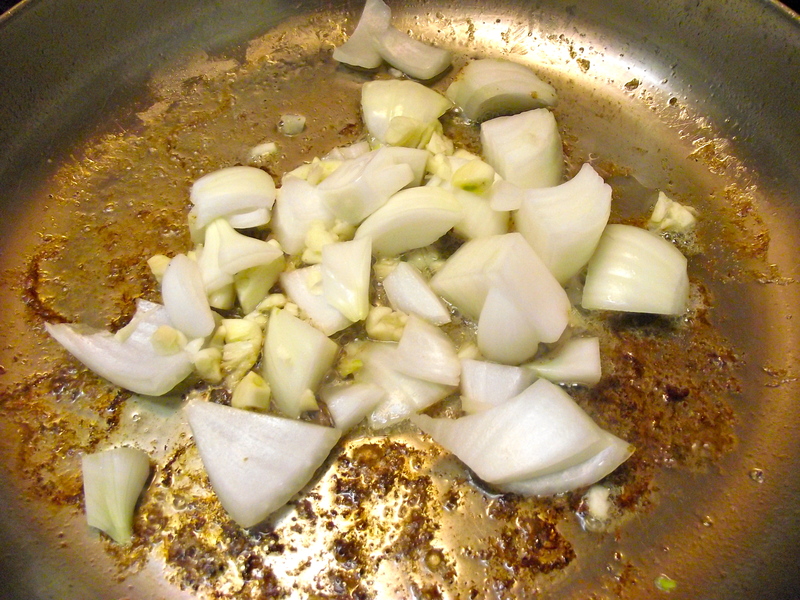 Step 5: Add the onions and garlic. Fry them in the leftover oil from the meat. Yes, I just said leftover oil. 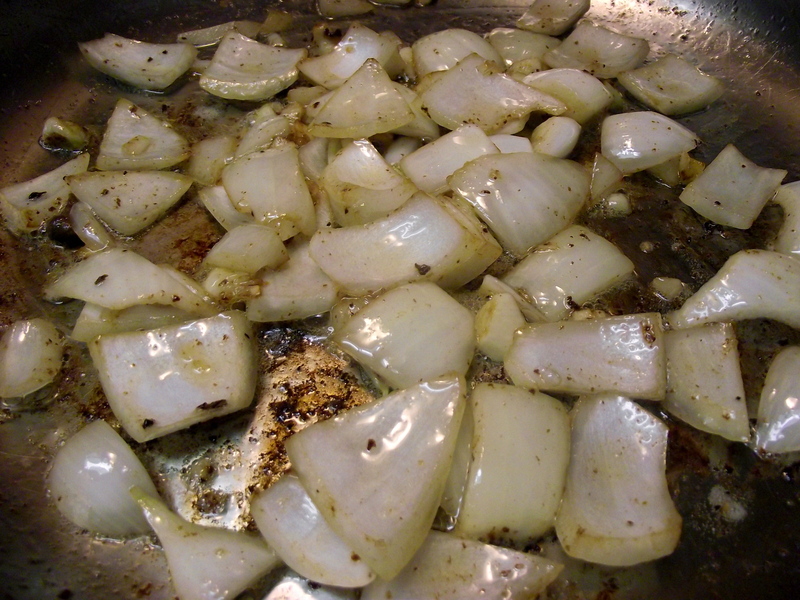 Step 6: Keep frying until the onions are soft then turn the heat down to medium low. Watch out for the garlic and make sure it doesn’t burn. Burnt garlic transcends through everything. You can’t mask it. Trust me, I’ve tried. Don’t worry if you have brown flecks of meat sticking to the bottom of your pan. We’ll lift those up when we make the sauce. It makes the stew taste unbelievable. Step 7: Add the flour then add the beef broth. You can also use chicken, or vegetable broth. 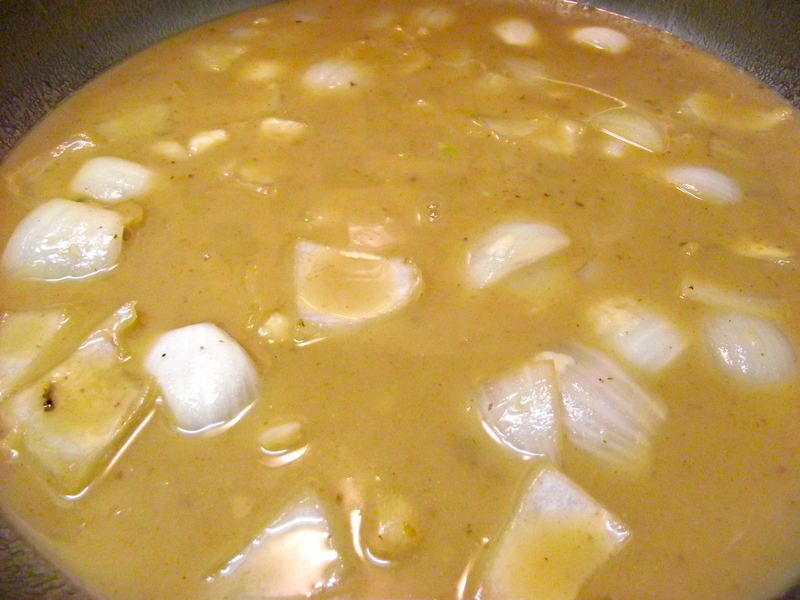 Stir until everything melds into a creamy gravy. Season with salt and pepper. Taste and taste again. You’ll find the brown crisps will scrape off and lift off easily into the sauce. Taste it one last time and think about making this into a gravy for the mashed potatoes. Hmm next time. I placed all the veggies into a slow cooker because I still need to get a deep stew pot. Silly me only brought a frying pan and a sauce pan when I moved. What was I thinking? Two things: First, you can do this on a stove. Set the dial to low and let the meat cook slow in a deep pot for 6 or more hours. The slow heat breaks down the collagen in between the meat fibers – that really makes for that soft and melt in your mouth beef. Second. Don’t add the veggies with the meat like I did here. 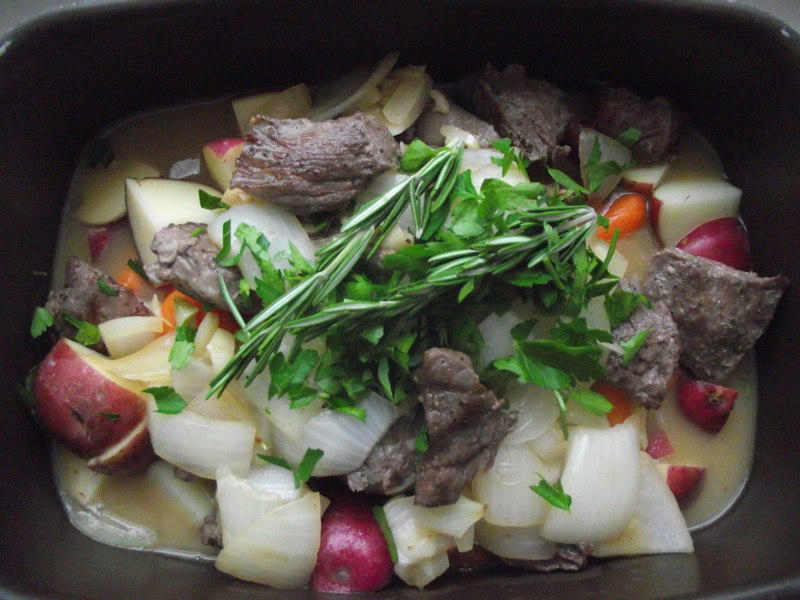 At the start of cook time, you should only have the meat, stock (with garlic and onions) and herbs. When I checked half way through the cook time, the veggies had already finished cooking while the meat was still half way done. I had to spoon out the veggies and put them aside until the meat was finished cooking. Add the veggies halfway during the cooking time. Add the peas last. When I say last, I mean when you’ve turned off the stove and are ready to serve. 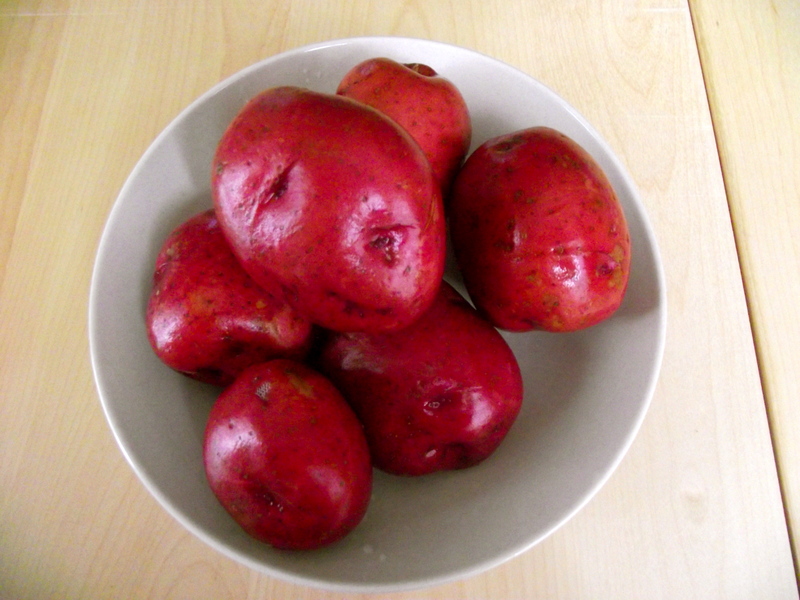 They cook in no time and you want to avoid turning them brown. Finally, taste it. Salt more if needed and serve. Then take a long nap because you have food coma. I took the decadent route and made mashed potatoes to pair with this meal. I’ll post that recipe up sometime soon. Serving options are endless: have this as is or serve it with a slice of crusty bread. You could hollow out a sourdough and make a bread bowl out of it. Either way you have it, there’s nothing like a hearty meal like this to warm your soul when it’s a blistering 4 degrees outside. The total snowfall measured around 18 inches the next day. What! They’ve got to give us a snow day now, I thought. But of course they didn’t. I suppose I should expect that in the northeast.